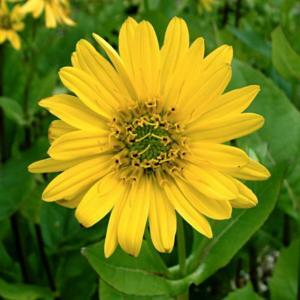 Large clump-forming perennial with sturdy erect, squarish stems and opposite, large, broadly triangular to ovate, coarsely toothed leaves up to 35cm long. Distinctively, the upper leaf pairs are fused around the stem to form a cup in which dew water often collects. Open-branched clusters of daisy-like, yellow flowerheads, about 8cm across, from midsummer to early autumn. Moist to wet, moderately fertile, deep soil in full sun or slight shade. Does well on heavy and clay soils. From seed or division. Will self-seed in suitable positions. Interesting plant for large borders, wild areas or stream and pond sides. The stem exude a gummy sap when broken, this has been used as chewing gum by the Native Americans. 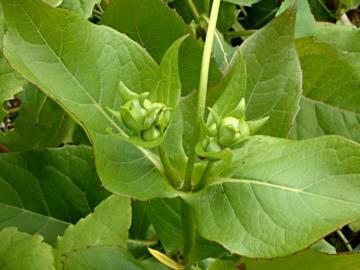 Also used by the Native Americans as a medicinal herb. Native to the Midwest USA, found on tall-grass prairies particularly in damp areas such as along water courses, floodplains and woodland edges.